Shiny bright moon: it reflects 70% of sun rays back into space. The surface is young: 50 million years old, only a few impacts made craters on it (the surface of the Moon is from 3000 to more than 4000 million years old). Size: Barely smaller than our Moon. At Jupiter’s distance, the Sun has only a very weak amount of light; therefore, these worlds orbiting Jupiter are really cold. The crust of the moon Europa, that is its outer part, consists of H2O, water-ice. It has no atmosphere, that is, the frozen ice on its surface directly contacts with the vacuum of space. In its interior heat is produced, which probably keeps H2O in a molten state below the surface. Even life may have developed in this subsurface ocean. As nearby Jupiter and large nearby moons attracts Europa with strong power, it causes distortions and tension on its solid ice crust. Where this stress is not endurable by the ice, it rigorously breaks and a crack appears on the surface. Reddish material bursts out to the surface along the cracks. 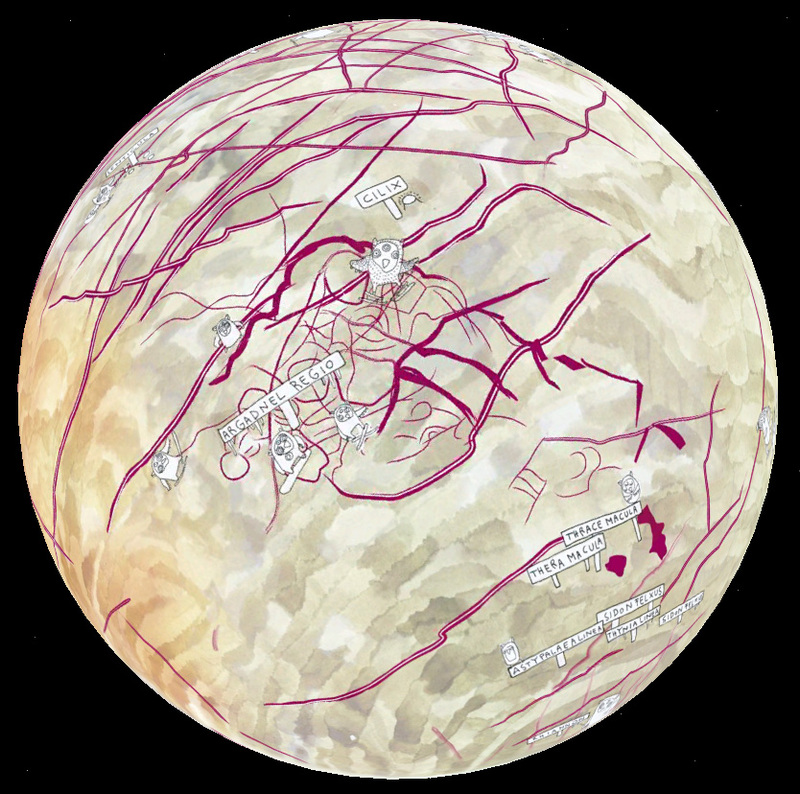 Two main types of terrain alternate on Europa’s surface: bright icy plains criss-crossed by cracks and dark mottled plains with many “chaos” areas. The mottled plains are formed the way that the bright material of icy plains grows thin at the bottom, so it may also partly melt and break into slivers. In these areas without cracks, ice flow debris frozen onto the surface dominates. 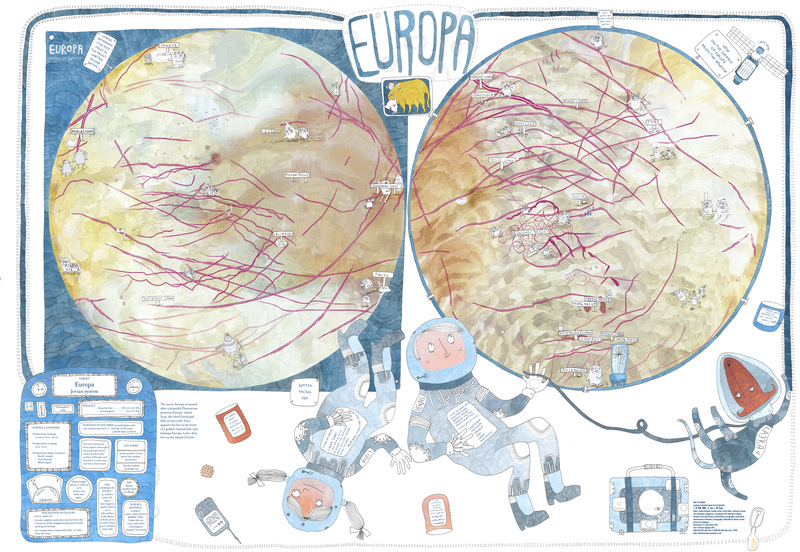 Is Europa a continent, planet or moon? The continent, where we live, is Europe. The planetary body you can see on the map is a moon that orbits around the planet Jupiter. Jupiter has three more large moons, and more than 60 much smaller ones, too. How do we know how old the surface of a planetary body is? The fewer craters there are on the surface, the younger it is. Only a few young craters can be seen on Europa; the fate of old ones is unknown. What makes Europa so bright? Europa is also illuminated by the Sun’s rays, but because the ice is very bright, its surface reflects almost all incoming beams. Why is it so cold (-160 °C) on Europa? Because it is far from the Sun and ice on this moon reflects the Sun’s rays. What is the difference between a space probe and a spaceship? A space probe is a vehicle built to research planetary bodies and take photos of them. A spaceship can transport people. No spaceship has visited Europa yet, but a space probe has. A drilling-floating robot is also planned to be sent to Europa, which could get through the ice crust by melting it and through the hole it could slip beneath the thick ice. Popping out on the other side of the hole, it could research the water-world of the moon. Such robots have already been tried in the ice of Antarctica. How do we know what the surface of Europa looks like? Europa is too far to make photos of it from the Earth, so space probes are sent there. How can Europa turn always the same side toward Jupiter? Doesn’t it rotate? Yes, it rotates and makes one turn in exactly the same time as it takes to go around its orbit. Who gives the names of the surface formations? An international board of astronomers and planetary scientists. The names are mostly taken from the mythological history of Europe. What would happen if you replaced the Earth’s Moon with Europa? You would see that there is a nearly same-sized moon in the sky, but it would be much, much brighter. The ice would sublimate (evaporate) on the light side, and thus atmosphere and clouds might be formed, and maybe even snow would fall. If the atmosphere was thick enough, ice would melt on the day side, but on the night side it would re-freeze again. Liquid: very deep ocean under the ice crust, may be exposed at new cracks. Exposed water immediately freezes because it is so cold and boils because at vacuum water boils at 0°C. Endogenic features: lenticular chaos terrain formed by subsurface volcanic heating that melts the ice crust. Common features: fractures in ice formed by the deformation of the crust. Rare features: impact craters. No volcanoes on the ice surface. Life limiting parameter: no atmosphere. Life may exist in the warm, liquid, subsurface ocean. Nomenclature: Celtic places, gods, heroes and people and places associated with the greek Europa myth. Highest point: Europa has very low hills because the relatively warm ice floating on and heated by a subsurface ocean cannot sustain large topographic differences. Age: less than 100 million years (new ice resurfaces the moon geologically rapidly). Europa map: (Illustrator: Csilla Gévai) The map of Europa features cracks and creatures that interact with the cracks in various “winter-like” scenes. The main characters of the map are two young astronauts, a boy and a girl, floating in a spaceship. For Europa, the most problematic issue was the color: many different false color views have been published; we selected the most “naturally” colored photomosaic, which served as a guide for the colors of the hand-drawn map background. The purplish color of the cracks and lenticulae (lenses) is probably due to brine-like materials ejected from below the ice crust, from the subsurface ocean. The map shows the hemispheric color dichotomy of Europa, the trailing hemisphere is more brownish than the leading one, probably because Jupiter’s magnetosphere moves ion particles faster than the orbital velocity of the moons (Jupiter rotates every 10 hours) so the particles hit the trailing hemisphere of the moons, i.e., “from behind” and make chemical changes in the composition of surface materials. The leading hemisphere is covered by cleaner, pure ice. The trends of the cracks (lineaments) on the map follow the true crack configurations that were identified from several images with different illuminations and resolutions.